CEO primarily focused on sales. Operations works but only through heroic efforts of talented specialists. Despite growth, the CEO and CFO were concerned about slipping margins and increasingly inconsistent service. Focused effort to (a) help CEO evolve to be the leader of a bigger and more complex organization and (b) build a cohesive, resilient team that will facilitate smarter growth. 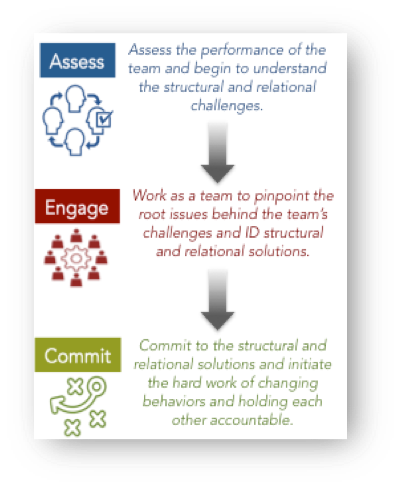 We deployed a pragmatic individual and team coaching approach focused on quick assessment, intentional practice, and ongoing evaluation and adjustment. To start, we helped the CEO and his key executives self assess as individuals and as a team. Very quickly these leaders began to practice giving and receiving feedback to each other and having tough discussions about their most important issues. They then began to make critical decisions about how to restructure the organization to help scale effectively. Our role was to observe, talk to managers and staff throughout the organization, participate in management and department meetings and to help the CEO and his team identify what’s getting in the way, what needs to be addressed structurally and behaviorally, and coach them as they practiced new behaviors and carefully implemented structural changes. The CEO is working hard to embrace conflict and more proactively address controversial issues such as compensation, hiring and firing, and holding people accountable. The CEO is also retraining the organization by being much more more direct and clear in his expectations and by delegating and holding his direct reports accountable. As part of his effort to delegate the CEO meets monthly with each department and works hard to focus on metrics and broad challenges rather than his typical approach of getting involved in solving day-to-day operational issues. Given his focus on sales, the sales team used to wait for direction from the CEO but now the team comes to monthly meetings prepared with pipeline status, updates on account plan progress and challenges, and reviews of coordinated 30-60-90 day marketing actions. This proactive approach is already yielding a stronger and more visible pipeline and strengthened relationships with targeted influencers and decision makers. The new leadership team was formed to reduce the span of control of the CEO and the operations lead and the team is working weekly to clarify responsibilities and strengthen process coordination all with the intent of improving productivity and service consistency.